Braden Scott smiles after practicing on the piano in Tomball, Texas on Friday, March 29, 2019. Braden was diagnosed with the mysterious syndrome called acute flaccid myelitis, or AFM, in 2016 and was paralyzed almost completely. 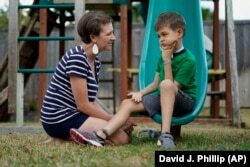 Rachel Scott, left, talks with her son, Braden, in Tomball, Texas on Friday, March 29, 2019. “Everyone is desperate for some magical thing” to cure the kids, said Rachel. Braden developed acute flaccid myelitis, or AFM, in 2016.